[Volta Region, Ghana]. 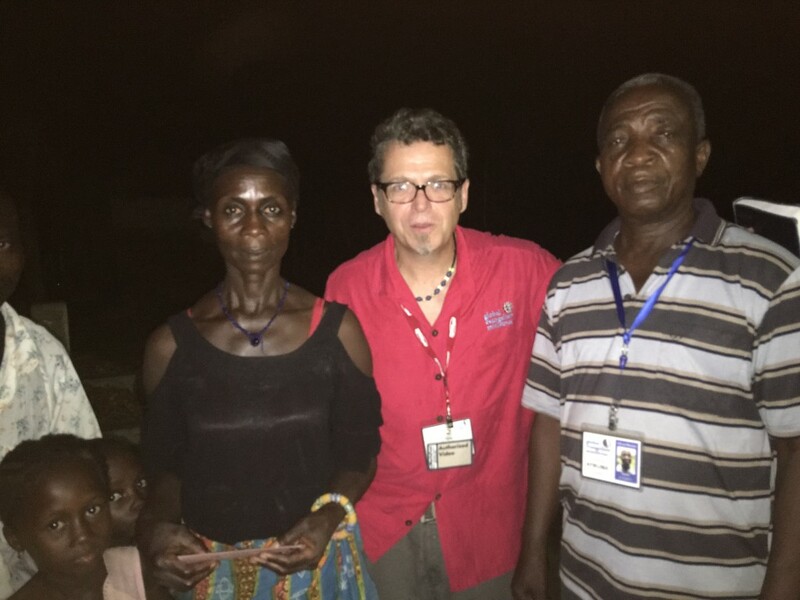 During this project into the Volta Region of Ghana our team has worked in village school assembly programs, remote film crusades, and a 5-day dental clinic. All-in-all we have stood face-to-face with over 31,000 individuals in 122 separate venues with 22,108 people indicating first-time decisions for Christ! Every person who prayed, gave, went, or came is able to share in this marvelous blessing of God. I hope you will pause and give praise to God for all He has accomplished here. Each team member has their own special stories to tell and I hope you will have the opportunity to hear from them individually. One story needs to be shared here. Earlier in the week, Andy Poe, while out for an evening film crusade, was approached by a woman as the national team members were breaking down and packing up the film equipment. This lady was asking Andy to pray for her. As he talked with her (through a translator) he asked if she had heard him preach. She replied, “No, I only walked up and heard you praying.” He probed further and asked this woman about her knowledge of or relationship with Jesus Christ. Andy quickly discovered that she did NOT know Christ. He shared the gospel with her and then she indicated that she prayed (with Andy) and asked God to forgive her of her sins, and asked Jesus to come into her heart. This lady then shared with Andy that she had been recently widowed and had six kids. She was also a local businesswoman, who was working tirelessly in selling food to the community. She shared with her that he also had a business and had learned the secret of trusting God with his business endeavors. “Business is not always good, but it is always in the hands of God” Andy proclaimed as he encouraged her to “Trust in the Lord with all your heart and lean not on your own understanding.” This is a testimony to the heart and mind of all of gem’s evangelists. We never leave one behind. We are praying for another “ONE” tomorrow. I am certain there is a “ONE” in your path as well. Be constantly looking for the “ONE” that God puts in front of you. We are scheduled to return to Accra on Saturday and fly back to the USA on Sunday night. On behalf of Jeff, James, and Andy I express our profound appreciation for your continued prayers. Proud of you, man. Great seeing your updates!